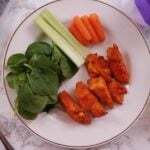 Weight Watchers buffalo chicken wings are a great snack, perfect for parties, and of course a healthy protein option! Check out this easy and tasty Instant Pot recipe. Turn the Instant Pot to saute to melt the butter. When it is melted add in the chicken, salt, pepper, and cayenne pepper. Mix the chicken so that each piece is seasoned. I've also placed frozen chicken breasts in the Instant Pot, along with the other ingredients (minus butter), and cooked for 16 minutes. I cube the chicken after it's cooked and continue with the recipe. Add 1/2 cup hot sauce then stir the chicken so that it is coated. Lock the lid into place and turn the steam valve to sealing. Using the manual setting cook on high pressure for 8 minutes. If your chicken is fully defrosted cook for 7 minutes. I used partially defrosted chicken because it is easier to cut. Release the pressure using the quick release method. In a hurry? Drizzle warm sauce before serving and skip the last step! Using tongs, remove the chicken from the Instant Pot and place on a baking sheet lined with aluminum foil. Brush the chicken with the additional 1/4 cup hot sauce. Thicken the sauce by placing under the broiler for 3 minutes. Turn the chicken over and repeat on the other side. Let the chicken cool 5 minutes before serving. Goat cheese is tastes amazing spread on top.